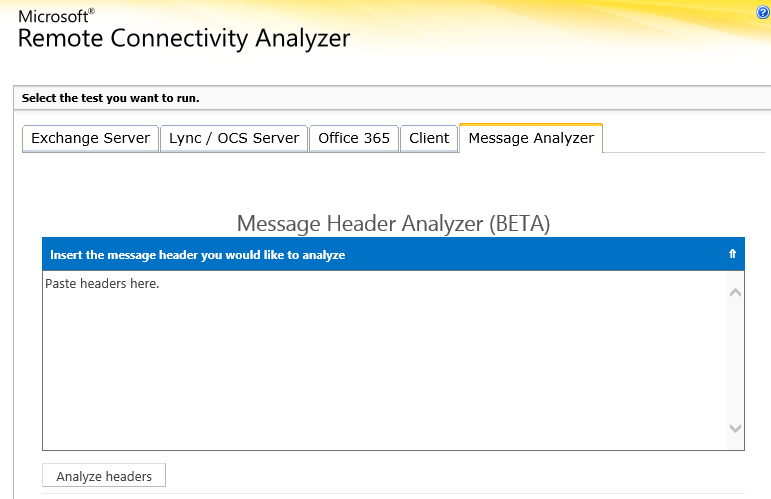 Now with Message Analyzer in Microsoft Remote Connectivity Analyzer you can easly check SMTP message headers which contains many informations which allows you to determine the origins of a message and how it made its way through one or more SMTP servers to its destination. To use Message Analyzer, all you need to do is copy message headers from a message and paste them in the Message Analyzer tab on the RCA web site. Useful for any header, whether generated by Exchange, Office 365, or any other RFC standard SMTP server or agent. Tagged Message Analyzer, Microsoft Remote Connectivity Analyzer. Bookmark the permalink.